With Paris under recent attack in a discordant world in which bad people exploit differences and legitimate need, in a beautiful city of proud and diverse citizenry, there is a constant hum that cannot be quieted. It is reassuring in the punctuation of bombs and terrorism, in France and in too many other world sites. It has been a few years since a visit to the Louvre, the national art museum on the Right Bank of the Seine in the 1er Arrondissement, the First District. A former fortress and palace, the Musée du Louvre opened in 1793 after the National Assembly of the Revolution decided that it should contain masterpieces. That it has and does, despite wars, depressions and the whims of humankind that try to depress the arts. The Louvre itself has benefited from strife, including receiving looted art in the Napoleon era, losing some to the British Museum after Waterloo. 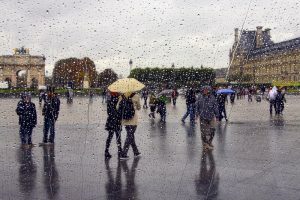 Yet for the visitor trying to escape officialdom and the oft-sorry consequences, the importance of the Louvre or any place of art as to the constancy of culture, history and genius — the better side of life — is priceless. It is akin to the flag still flying after bombardment. When I visited in 2012, on a rainy day in which The Inverted Pyramid, the famous 1993 glass addition, was covered with drops that gave an Impressionist’s view of people and place, September 2001 had passed, though the wounds did– have — not, but the terrorism of 2017 was yet to come. Yet Paris, its people and its famous Musée had already long endured war and the other follies of humankind. Displayed on the Louvre walls and sculpture platforms were proof that not everything is about horror, that the tread of culture cannot be ripped apart. If you are fortunate, before you grow up but as you so quickly grow up, you’ll get to spend a few years with a patient, somewhat quiet, a bit odd grandfather like I did, who had a knack for fixing almost anything with a pocketknife or a squirt of oil from the old-style cans, made of metal with a long spout. You thumbed the bottom, which was made of spring steel, and out came the oil. My grandfather could handle so many household problems with basic tools that it became a metaphor for building confidence. To this day, the sound of the popped can brings me to a place where I did not pay bills, where I was fed without cooking for myself, where I was chauffered in my parents’ car, where I was tucked in at night, where the sunrise and chilled air of spring promised a good day of day-dreaming and hope for the future. My grandfather did not say much, perhaps because he was raised in a time when you sat at the table with parents and simply ate, speaking only when spoken too. That he came from a Prussian family probably enforced the discipline. Yet he talked a bit at his own table, and certainly went beyond his usual word-thrifty ways when he took time to explain carpentry to me, or a fix for a leaking faucet or to tell me my bike needed oiling. Even if it did not, I would ask him to do so, having ridden the three miles from my home to his for that reason and others. Out to the garage he would go, an old, wooden structure with “novelty” siding, the floorboards of which had absorbed so many car leakings that the warming sun produced a woodsy, oil smell which in time would no longer be an odor but a tug at great and warm memory whenever I come upon a similar scent. So out to the garage my grandfather went, grabbing the copper oiling can from a shelf in the corner, just below markings my father made in the garage when he was my age. The bike would be oiled, as my dad’s bicycle had been, and I would be off on the same streets he rode upon. That ride home would mostly include a look for friends, or a stop at the small downtown A&P for a plum or two or three at 19 cents a pound, or some thoughts about where I would be in a few years, driving a car, not a bike. I did not usually think about my grandfather on that ride because I foolishly took him, my grandmother, their fine home and everything then existing for granted. I never thought that all could go away. Now I know better, which is not a better thing. It is simply reality, so nicely interrupted when I again hear the spring sound from my own oiling can. SAN ANTONIO, Texas — If music is a leveler, the proof is here. This city of mixed heritage, constant politeness and high temperatures seems to sing its way through the day and evening with song. There is music everywhere. This traveler, however reluctant, did finally make it back to where a son and family live, had a truly good time with two grandchildren and managed to make quite a few electrical repairs. In all the doings, there seemed to be music. When I went to hardware stores or big-box retailers, I heard country tunes. There were Mexican-style tunes in restaurants. The Alamo was festive with mariachi. Cars stopped at lights vibrated with a mix of music. It could be the heat that drives the rhythm, for you don’t think about the weather as much when the radio is on. It could be the rich mix of Spanish, German, Czech and cowboy that has all these differences communicating in a common element. It could be the easy smiles of so many here and a slower pace of life that actually allows them to think about noticing other people that gets the daily jukebox jumping. For certain, folk here go about their lives just like anywhere else. They work if they have a job. They eat in public places. There are families in the dog parks. There is romance. There is seriousness. There is sadness, too, and newspaper stories about bad things. Yet when the day dawns, and I head for 6 a.m. coffee at the Valero mart, already you hear the tune-up for the daily rhythm. Each city, each region, each nation, each town, even the smallest village, has its music, more audible, more vigorously expressed in some than others. Or more delicate or classical in some. You might have to bend an ear to listen, but the melody and, more deeply, the lyrics, are to be discovered. Sure plugged in at old San Antone. If you could see a person’s emotions, thoughts, likes and dislikes, even the soul, you would be looking at an abstract painting, for the elements of each reveal existence. Line, form and color are the abstract, however jumbled some or even many may term the painting, but if you would look closely, each of those are not only suited to the totality of the work but the colors, even their shades, the shape the painting takes and the lines that form it define the theme, the essence, the motor that runs. You then have a name, an identity, for the painting, whether it is from the artist or what you prefer to call it. Same with people. The individual can be part of a group, type, region, country, and so the picture of the person fits a general look, something you might well expect. Yet no two pictures truly are alike, however similar. The shape, the line, the hue of the individual constructs the man, the woman, the child. And if you care to study the human “painting,” you will see emotion reflected, not only in the present but what has drawn lines in the individual’s experience. Good times, not so good, joy, elation, sadness, etc., are there. Even the form of someone can be shaped by living, so very recognizable by those who care to look. The coloration is its own thing, and the rainbows of life itself are visible. Some viewers criticize abstract paintings, even offering the view that a child might easily do one. But, first, a child’s imagination and creativity can be near-genius, for it has not yet learned the world’s restraint. Second, the best of the abstracts are from within, and there the gift of wonder, questioning and willingness to take a chance reside. Abstracts contain the elements — the foundation — of all paintings, even well-executed portraits, landscapes and realism such as Edward Hopper’s American view. And so it is with humanity. We are each an abstract that shapes us from birth to passing.